The Linea Edmundo grows with the arrival of the new vitola, the Double Edmundo (ring gauge 50 and 155 mm length). This Habano will allow the classic blend of the Linea Edmundo's full spectrum of aromas and flavors to be enjoyed in an hours smoking time. This vitola was developed for those who are able to enjoy their cigars at a more leisurely pace. 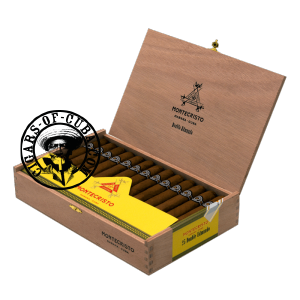 The Montecristo Double Edmundo incorporates the new Montecristo bands, which pays honor to the classic look of the brand. The Double Edmundo comes in to complete the line of Edmundo and Petit Edmundo. The Montecristo Double Edmundo incorporates the new Montecristo bands, which pays honor to the classic look of the brand. Sticky and spicy, the cigars meanders its way up to a stronger level in the second phase. Interesting notes of cocoa appear as you enter the final phase of this cigar. Powerful tobacco finish. This is a cigar that will bet much better with age, so if you have the time, lay them down for a couple of years.